If you’ve ever scratched your head at a PHP script and thrown in dozens of echos or logging statements to track the execution path then you’ll really come to appreciate the benefits of using Xdebug. 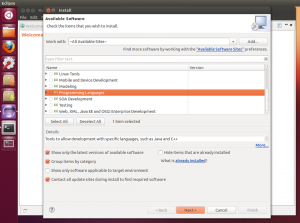 Configuring Eclipse and Xdebug isn’t difficult. In fact its painless with the correct steps on hand. That’s where this guide comes in. I found myself coming across incomplete or outdated forum posts and stackoverflow questions, so I thought I’d post what worked for me. 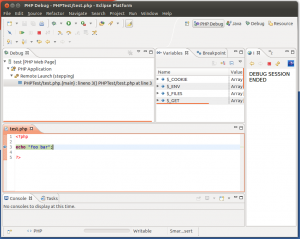 If you already have Java and Eclipse installed, then just jump ahead to installing and configuring the PHP Development Tools and Xdebug. This will install ~118 new packages, assuming you’ve not already installed some of them, and will total around 255 MB that need to be downloaded. 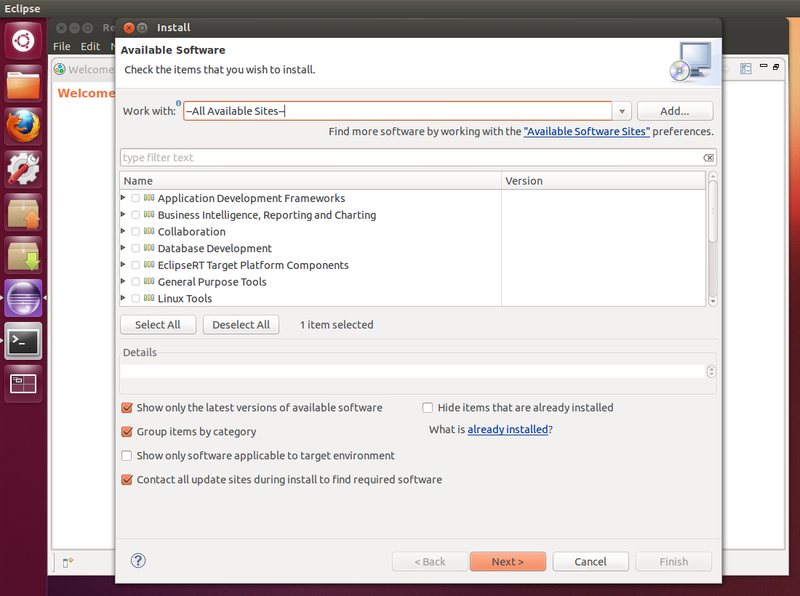 After the download completes, open Eclipse to confirm that it installed correctly. Leave it open for our next install. If you don’t have Eclipse open at this point, open it up. You will be prompted with a new window asking you to select a site or enter the location of a site. You should be able to drop down the list of sites and find one labeled “–All Available Sites–“. Select this option and wait for the list below to populate. Scroll through the list until you find a category labeled “Programming Languages” and click the arrow to expand this list. Continue to scroll through the Programming languages until you find a item labeled “PHP Development Tools (PDT) SDK Feature” and check the box to the left. Click Next and continue throw the installation. You’ll have to select that you agree to the terms of installing this software. 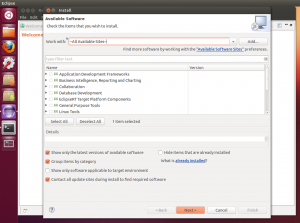 After the installation has completed, you will be asked to restart Eclipse to apply changes. 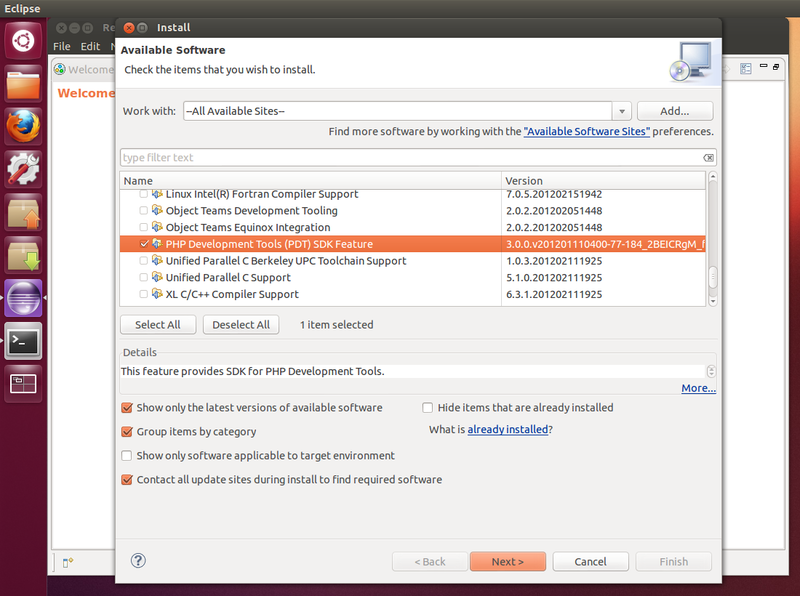 Go ahead and restart Eclipse, then move on to the next install. After installation completes, there are a couple of files that need to be configured. If you copy and paste the commands below, make sure to check that the quotes that are copied over are regular quotation characters, as they may cause problems if they are not. After loading the php info page, search for “xdebug”. 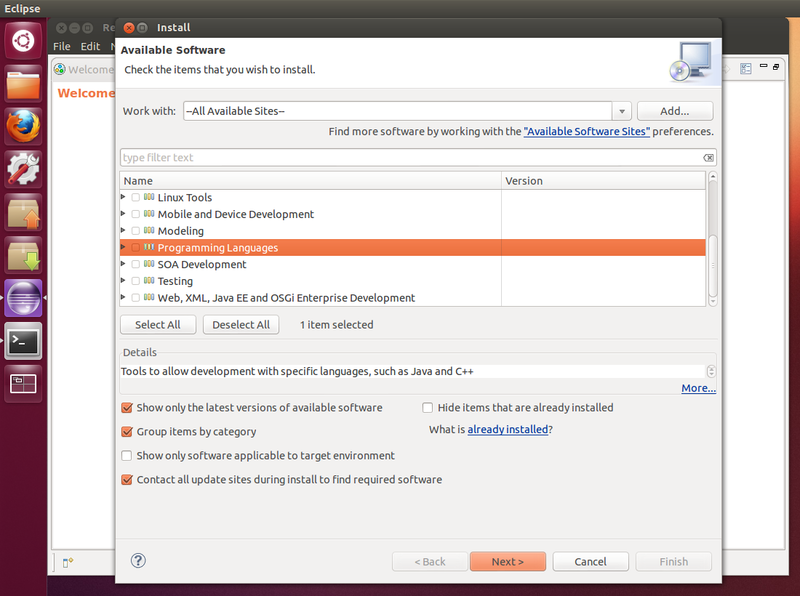 If you find it listed, then you have successfully installed and configured Xdebug. If not, check back over the steps listed above or consult Google. After you’ve finally gotten everything installed, you’re probably anxious to start debugging. You’re not far off. 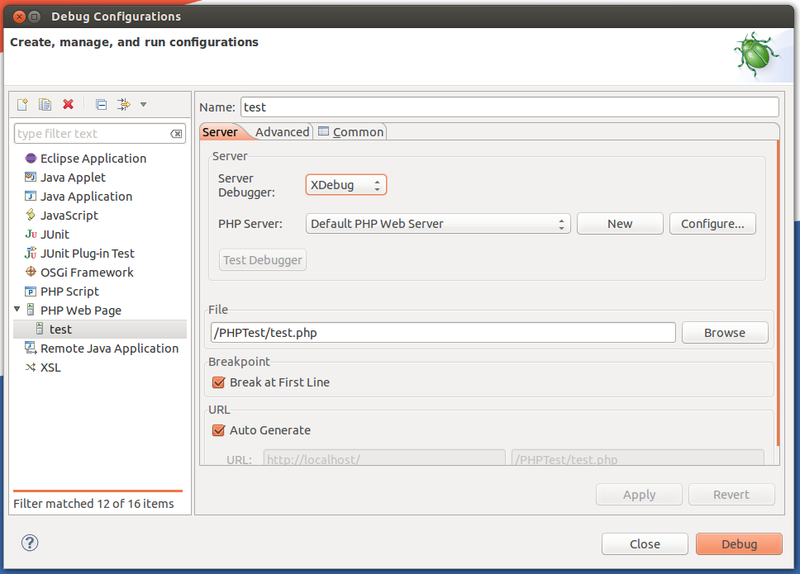 The only thing that’s left is to import your PHP script or site and establish a Debug Configuration for your project. 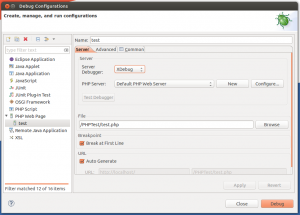 To import a site, simple select: File -> New -> Project… -> PHP -> PHP Project. 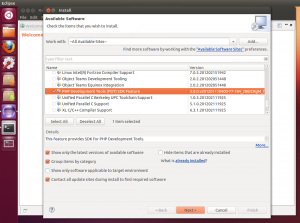 This will open a new window where you can open PHP files from and existing location. Assuming this location is in your public root directory in Apache, you can work with these scripts in real-time. Make sure that you’ve selected Xdebug as the Debugger type. Click Apply and then Debug. 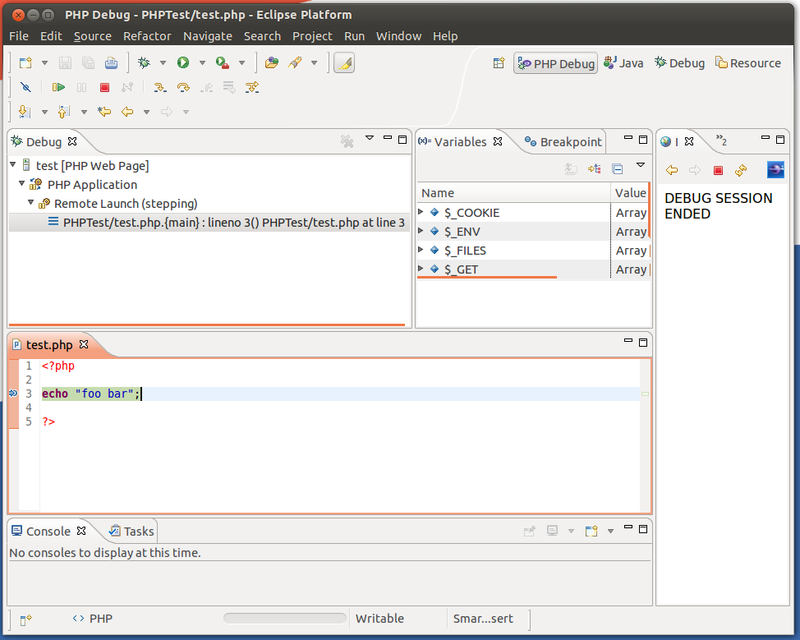 This will open a “Debug” perspective in Eclipse, allowing you to view variables and stack traces live. Assuming you’ve created a breakpoint or selected to break at the first line of the file, you should now see your PHP script paused waiting for you to debug! Tip: If you’re planning to debug a large project such as a WordPress, phpBB, vBulletin or any other large web application, pointing the Debug Configuration to your index.php makes debugging much easier. Congrats! By now you should be beginning a new road to a much easier life of PHP development. Very handy article. I’m used to debugging PHP the brute force way by, as you said, echoing out values on the page or logging out to a file. Mostly I didn’t want to take the time to do what you did here. Kudos to you for putting this together and thanks for sharing.